Cynthia Cranes Art and Gardening Goodness: GROW YOUR BLOG Party ~ And Three (yes 3!) Giveaways! GROW YOUR BLOG Party ~ And Three (yes 3!) Giveaways! This is my very first GROW YOUR BLOG party so I'm putting on my best dress. Meet Fifi Fashionista. Just like me, she needs to clean her room and finish some of her projects. Like this sketch that I had planned to "someday" turn into a collage painting. Thank you for coming to my party, and if you are a fellow blogger joining in on the 2 Bags Full GROW YOUR BLOG party as well, I may just dash over and visit you, too! Now lets get this party started! When it comes to blogging, I'm just a baby. Now for a sampling of those goodies. How about a cutesy recipe card you can download and print out? Or a tutorial on making snow globes? Have a passion for gardening and garden books? Well, as you can probably tell by now, I am an artist and a crafter and a gardener. I love to cook and I love to play and I love to make new friends. A peach orchard a couple miles from my new home. And I love my new home. I've recently moved back to my home state of West Virginia - rolling hills and valleys full of orchards. This was not planned, mind you. I married my high school sweetheart in 1980 and moved to Richmond, Virginia where we stayed for 32 lovely years. I never thought I'd ever move back here, but fate has a way of turning the tables on you, so here we are. My world for the past 18 mos or so has been very small, but doors are opening....slooooowly....and I'm finally settling in here. I'm so grateful for this opportunity to meet new friends and expand my circle in the blogging community. So you see, although my life may not be perfect (is anyone's? ), I still thinks its pretty wonderful! Enter to win these Ceramic Buttons from Cynthia Cranes Pottery and a Very Special Pincushion by Fiberluscious! To celebrate my very first GROW YOUR BLOG party I'm having a special GIVEAWAY CONTEST today! 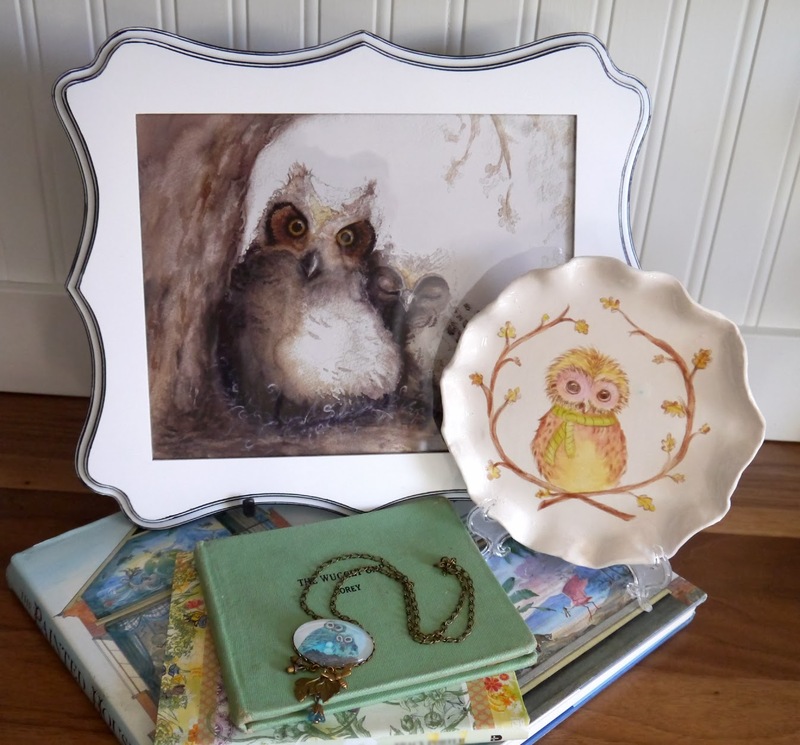 The winner will receive an 8 x 10 archival print (unframed) of my "Baby Great Horned Owl Sleeping" watercolor painting, a Victorian style necklace made with a small print of my "Proud Parents" owl family watercolor painting, and my handbuilt and handpainted "Tiny Tia" porcelain ceramic plate. This Contest is open to anyone and everyone both near and far. All you have to do is comment on this post and be sure to leave me an email address to contact you if you win. The Contest closes on February 15 and the winner will be announced soon thereafter. Good luck everyone and thanks for coming! ***How to Comment: I use Disqus and the comment link can be hard to find. It will say "comment" and is either red or gold. When the comment screen opens you have the option to comment as a guest by clicking in the tiny box at the bottom of the screen. Then you'll need to put your email address in the comment of separately email me (claybakin247 at Yahoo dotcom) so I'll be able to contact you when/if you win. Remember to email me your email address if you comment as a guest! I'm visiting from the Grow Your Blog party. Your artwork is lovely! Beautiful! Love the garden photos. I love gardening also. This is a wonderful blog. You are a talented painter. I joined you with Google+. Looking forward to vicariously enjoying West Virginia! Cool blog Cynthia, I love a lot of the things that you like too. Looking forward to following you! such lovely and adorable art. reminds me of Beatrix Potter. And West Virginia is a beautiful place to live! I'm visiting from GYB; thanks for visiting me too. Cynthia -- I am so happy that you are a part of this party -- I am anxious for folks to meet you and come to love your wonderful talents --- we must meet someday --- send me an email and tell me where you live! Well that was confusing. I posted just to have it lost. O.k. new start, I have enjoyed this post so far and have followed several, but yours put a great big smile on my face. your style of writing makes it seem like your sitting in the same room. and your work is beautiful. You should get many followers . and the give away should help too. (tonia.conner@twc.com) had to get that in there. I'll wish you good luck but don't think you will need it. hello Cindy, lovely to meet you, thank you for popping by. My goodness your works are beautiful! It never ceased to amaze me the talents that are out there in blog land. So so pretty creations I'm looking forward to catching up with you regularly. Your blog is beautiful, Cynthia! Thanks for joining my site --- I look forward to sharing life and art and joy with you. We drive through WV every summer on our way up to Michigan. Truly a beautiful state. Sending blessings from the farm here in NC! My e mail is maryannpotter@gmail.com. Hello Cindy, nice to meet you, I really enjoyed your art work, I am following you and hope to see more. I would love to be included in your contest. Hi. I'm visiting because of the Grow Your Blog Party. I loved seeing your art and the beautiful place you live. Your blog is charming and your sketches adorable. I've just moved too. Still going through an adjustment period. I'm fond of owls, I keep hoping to see one on our property but I know it is difficult. I would just like to know they are here. I'll email my email. What a sweet blog! 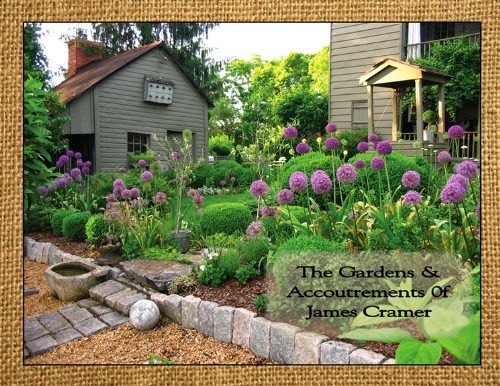 Found via Grow Your Blog... lovely garden photos! Love your sketches, they are beautiful. Thanks for visiting my blog today. Please enter me in your giveaway. Nice to meet you. I too am new to blogging but it can be a wonderful experience. I enjoyed your blog and will stop by again. I love your blog and attitude! Your art is lovely and so are your pictures of your gardens. Thanks for visiting my blog. I just joined yours too -- it's lovely. Your work is positively lovely and what's not to love about owls?! I hope you'll have a chance to visit my blog as well at ascattering.blogspot.ca Cheers! Beautiful paintings. Iam looking forward to reading your posts. Visiting today from 2 Bags Full blog party, what a great time I am having visiting all these wonderful blogs. I love, love your paintings of the owls. Thanks for the wonderful chance to win your fantastic art. Hi, I'm visiting from the GYB party. Thank you for you visit to my blog.I love yoru art and am looking forwrd to reading more. I have enjoyed my visit to your site with the Grow the Blog party. I enjoyed your art so much. Thanks so much for sharing all of the pictures. Hello! So glad I found your blog! It is quite lovely indeed! I'm moving to the mountains of Western Maryland in the next few months so maybe we will be close?! I just signed up to be your newest follower and cannot wait to see more of your blogs! Hope you will stop by and view mine too. Wow, you are quite the artist Cynthia! I love your little animal drawings, so cute! I would love to be entered into your draw. So glad to have found you through Vicki's GYB party! I shall be sure to become a Follower. It is so nice meeting you through Vicki's GYB party today. All your pieces of artwork are wonderful. I especially like the little woodland creatures in them. You are blessed with much talent! Perhaps you will stop by my humble little blog to check things out. 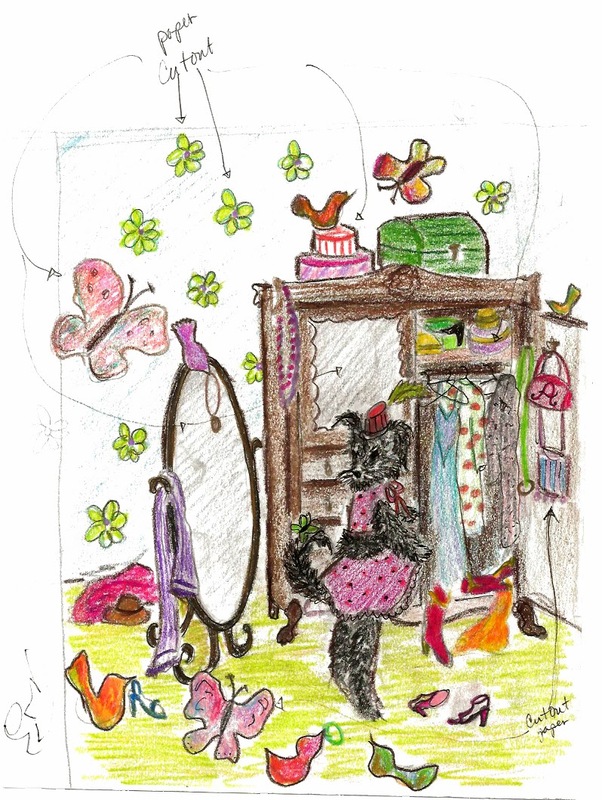 Cynthia, enjoyed stopping by your blog and seeing your delightful watercolors. I also love gardening. Howdy from a transplated Wild West Virginia now in OK. I miss WV everyday and think about moving back but... One of kids lives in OK and the other in NM so it's not very feasible for being close to the grandkids. I am a crafter and absolutely adore the buttons. I don't have artistic ability and am thrilled when those who do utilize it. You work is amazing. I haven't had flowdies in my yard in years and I think this is the year to do that, again. It makes a house seem more like home. You are very generous with your giveaways - thanks for the chances. I am a follower now via Bloglovin'. I am here to welcome you to the GYB party hosted by dear Vicki, as a Volunteer to support her in visiting and welcoming you and the 500 plus blogs. Your lifestyle is a little like my own. Your pottery and water colour paintings are so very beautiful - you are a woman of great talent. 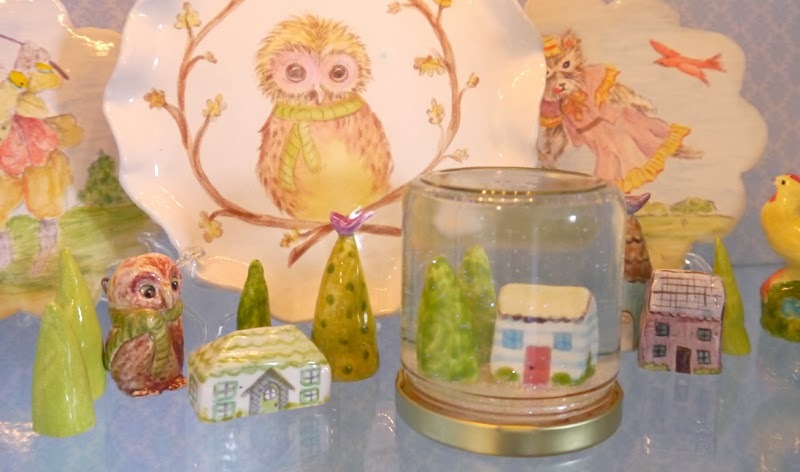 Those owl parents are some of the most gorgeous owl paintings I have ever seen here in blogland. It would be an honour to win a little of your creativity. so many gorgeous projects :D It's wonderful to see what you do. Hi, I'm visiting from St. John's, Newfoundland, Canada. Nice blog! Thanks for the giveaway. What beautiful work you do! Love your paintings! Si glad I found your delightful blog through Vicki's GYB party. You are very talented. I'll make sure I let people know about your gorgeous freebies. Hugs Melody in Melbourne. Love your owls! They are such wonderful birds. New bloglovin follower: Nicole Sender. So I'm doubly pleased to see you've joined the party! 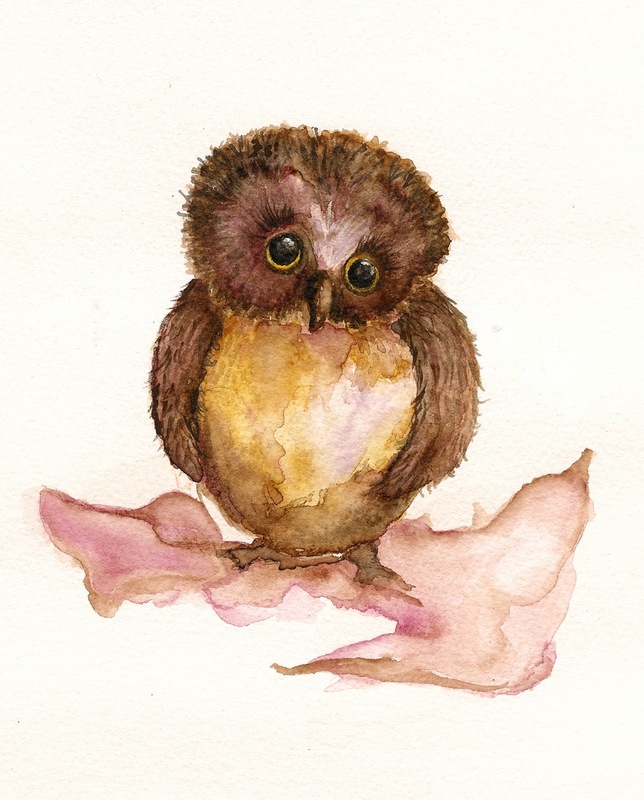 Your art work is stunning and that baby owl is very special - who could resist him! I would love you to come over and enter my giveaway too! Enjoy the party! Happy Grow Your Blog Party! I fall in love with your designs! I'm in love with the owls! Your work is adorable. I especially like your buttons. Hi Cynthia, I've popped over from GYB. What a lovely blog and beautiful creations you make. I've joined your followers and look forward to returning. What adorable paintings! Popping over from GYB and so pleased to have found your blog Cynthia! Howdy Neighbor Cynthia...I'm Sandra, in southwest VA, Tazewell County, and love your art...reminds me of Miss Potter, whom I adore. I'm still reading Susan Branch's book, A Fine Romance, and am visiting, with her, Hilltop Farm. Here, I'm visiting via Vicki's GYBP and enjoying, greatly, your blog. What a lovely blog you have….and the sweetest header I have ever seen. Please toss me into the giveaway! I am a bit obsessed with owls lately. I hear one every night and I am dying to photograph that elusive creature! So nice to find you! Oh and I am also having a giveaway! I found you from the party-and I am in love with your blog and would love to be entered into your giveaway. I love Fifi Fashonista. My daughter's name is Fiona & though I call her Fi, her friends call her Fifi. & she has quite the unique fashoin sense! Thanks for sharing your blog. I can't wait to read more posts. I am an embroiderer participating in Grow Your Blog too. I love your art Cynthia! I especially have a thing for owls too! Great art- Love the detail and owl theme! mysweetpumpkins at gmail dot com. Love your owls! You have such talent! Wow! I would love to see that orchard in person when it is in full bloom like that! Beauty at it's best! I love your artwork and plan to come back and read back through your blog. Your giveaways are very generous! Thank you for sharing with all of us. Hi Cynthia! Stopping by from GYB party. You have lovely artwork and pottery. I am currently enrolled in my first clay class right now so we shall see what I come up with. :) Hope you are enjoying this blog party! It sounds like we have a lot in common and your owls are so cute! I'm hoping to have one come into my garden...I've heard him but he's being very shy so far! We have just arrived back in the UK from 24 years of travelling and our last destination was Australia...not a lot different from Scotland eh? Enjoy the party and thanks for sharing a little of your world (sorry...wonderful world)! Beautiful paintings! I am so amazed by them - they are just simply gorgeous! I am stopping in through the GYB hop and I hope you have nothing but success and blessings in the new year! Thanks for sharing your incredible talent with us! I am visiting you from Germany with the GYB party and love your place. Your art is beautiful! I am a new follower and am looking forward to learn more about you. Nice to meet you, I'm visiting you today via GYB and have found we have a number of things in common and would love it if you would find my blog. Can't say anything red in the comment will apprear but do know we share the same name, love gardening and making friends. Oh that train wreck, must have colidded somewhere with the train I was on. So pleased I found your wonderful blog, your artwork and gardens are gorgeous. Joining your blog thru the hot - you are a wonderfully talented gal - can't wait to see more! Good to meet you - I'm visiting from England! Love your drawings! I have to admit I have slightly downcast my art in recent years. And do mostly crafting. Will keep an eye out on your baby steps. Would love to be included in your gorgeous giveaway. I am commenting through my google account (so not sure if you get an email with that, but it can also be found via my blog on my profile). Greetings, Cynthia! I'm here from GYB. Glad to meet you! 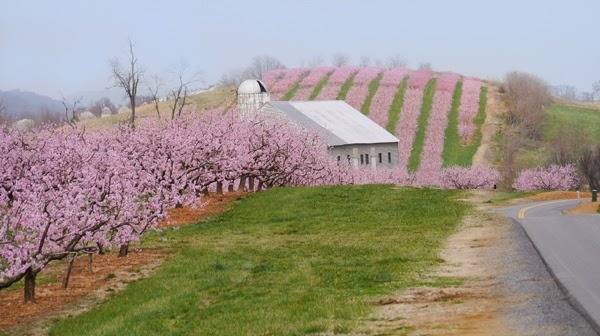 Love that photo of the peach orchard near your home. What a lovely area you live in. anudgeatgmaildotcom. am now your newest follower with Bloglovin. If you get a chance, please visit me at http://meadowbrook-Kristen.blogspot.com/. Your artwork is just gorgeous! I adore owls! Thanks for the wonderful giveaway! Reviewing being a newbie blogger I missed some minor details like making comments... But Vicki's Grow Your Blog Party entries are 600 bloggers. My reading was a little tasking. I wanted to read and get to know the girls so I did read everyone's bio 24 hours left to go now I just review at much as I can. If you like come visit My site http://overboardcreations.blogspot.com/and contact info is http://ovr_brd@yahoo.com I believe inspiration comes from all facets of life even knowing the great people out there with wisdom and knowledge the do's and don'ts and even the wonders of life from a personal point of view. I liked you following you on goggle connect and Bloglovin you. hope to see you in the cyber neighborhood I am new to blogging so I don't have a lot posted because I got side tract with GYB party. Kind of felt it was important to have some one read my silly chatter. I can't remember a time I didn't dabble in something creative. I tried a little of everything. But, my new love these days is Card making I just love it. Oh thanks for letting me enter your give away. You find the link to my blog Swapping Howdies on Vicki's party list -- just in case you want to come over to my "home," too. Thanks for the chance to win one of your lovely prizes -- that's very generous of you. First I must say that I love your Baby Owl. You are so talented. Glad to hear things are going well for yall as yall settle into your new nest. Such generous giveaways too. I look forward to following your creativiy..
You are such a talented artist. I'm most impressed. I could go on but I've never had luck commenting with Discus, so I'll leave it short in case it doesn't work again. Those buttons are the cutest! Hi, Cynthia! Your work is beautiful! Thank you for stopping by and inviting me over! We definitely have some things in common. I love to cook and garden as well. There's nothing like sticking your bare feet in the dirt or the yummy smells in a kitchen! Ad the peach orchard is beautiful! Love your art! I cannot garden as I live in Las vegas, trust me I tried..I do better lounging in the pool...but I do love reading blogs and seeing their gardens!! Looking forward to reading your blog! OK, let me try this again. I've never used disqus before. Sorry. Hi Cynthia. I'm visiting from Grow Your Blog.... Absolutely love your artwork. The owls are precious! Can't wait to see more. Love your blog header and all the rest of the page too! I am following on Bloglovin. Off to check out your pinterest boards.